Doing chores such as laundry have come a long way. Take Mildred and Gertrude, for example, not exactly lovin' life here. 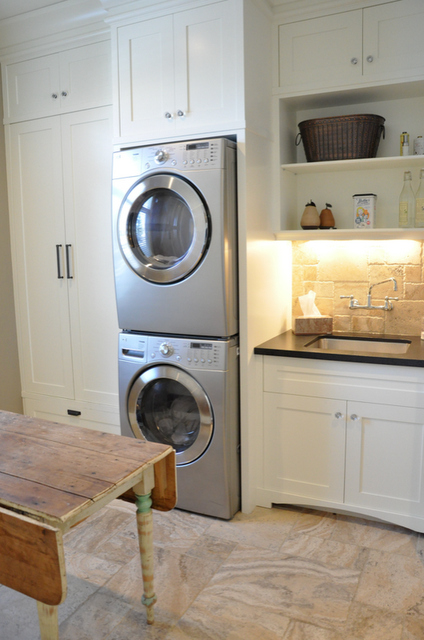 Nowadays, laundry rooms have become another room to bling out. And I'm all about it. Why not turn something that's a necessary evil into something you enjoy? Okay, well you still might not love doing laundry but at least your surroundings could be beautiful. Here are some laundry rooms that make me wanna roll up my sleeves and scrub those grass stained clothes. The pull-out clothes rack is super functional. I got one at a thrift shop recently that I want to make into a wall mount version like this one. And I must get something to hang my ironing board up on. Love this idea. 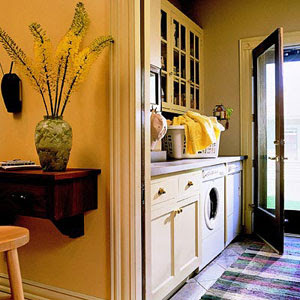 It's a great idea to have some cabinetry in your laundry space. We saved a cabinet from our former kitchen to use in our future laundry room. I've seen lots at the Habitat Re-Store that would work well for this job. We will have a utility sink--which aren't the prettiest things to look at unless you do something like this to it. 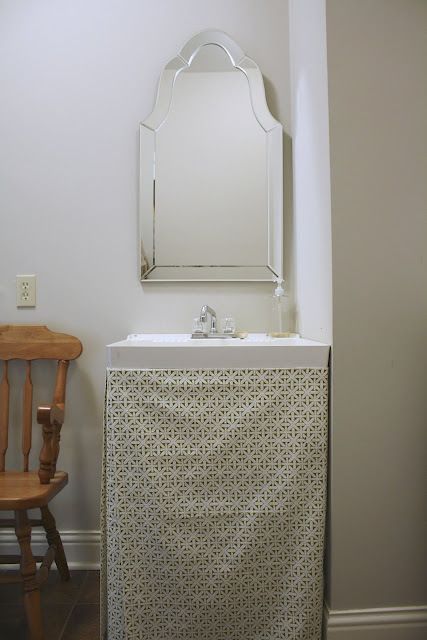 Amy over at Plain & Fancy Living has a tutorial to make your own utility sink skirt. I'm planning on trying my hand at one myself. Here's hers. Isn't it awesome? This will be how our laundry area will be set up. It'll be located behind our new back door. I don't want ours completely open like this one since it'll be in the main entry. 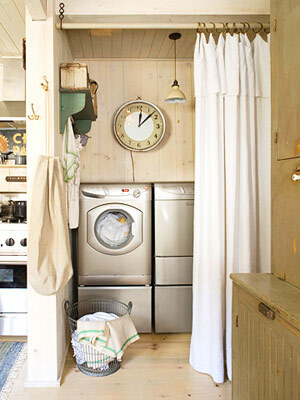 So this is the plan: run a curtain along the front of the washer and dryer. Love the casualness of this look and plus I didn't want 15 doors all opening up at the same place, know what I mean? Fun art (although I don't think Gertrude would approve) and a smart idea to install a bar to hang wet things from. Okay this laundry room is the size of my kitchen--maybe bigger. A carrara marble topped island in the middle? Yeah, I guess I'd take it. Stackable version in a closet. Great space saver. 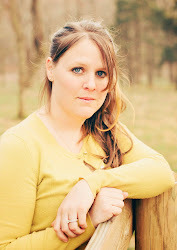 And this one might be my fave. I think it's so cute in all its retro flair. Oh and I have that laundry sign and plan on using it in the new space. And I have a cool story about it too that I'll share someday. 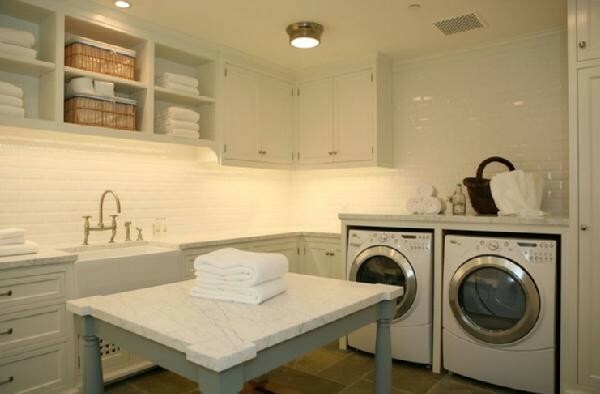 This is designer Danielle Oakey's mom's laundry room which is just beautiful. 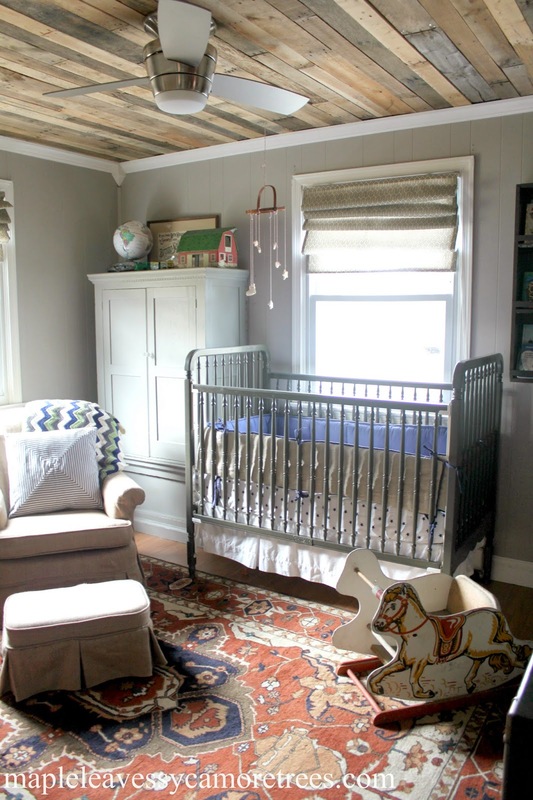 And this one was designed by Urban Grace Interiors. I have a similar light fixture that I want to incorporate into my design. 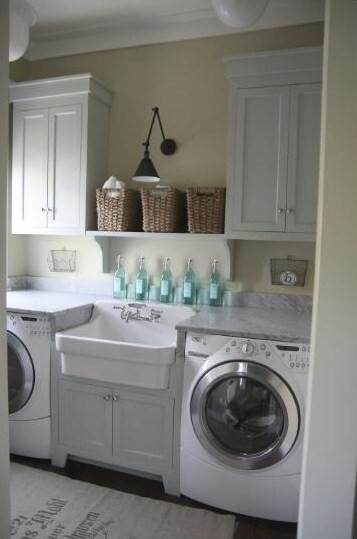 And now...the dream laundry room you've been waiting for! Here is my current one in all its glory. I know, hard not to be jealous, right? Do you spot our saweet Flyer dryer? Uh huh. Okay, no seriously, the above picture soon will be gone (we're removing that beautiful pink insulated wall and that area will be our dining room.) and the new laundry area will be here. So I have high hopes, peeps. I can see it all in my head, believe it or not. A little bit of paper, paint, blood, sweat and tears...okay, hopefully not the blood or tears part, but I'm sure there will be a lot of sweat involved. And hopefully soon I'll be able to share the transformation with ya. Actually, considering what I did to my face last weekend when working out there, there probably will be more blood and tears before this is over. 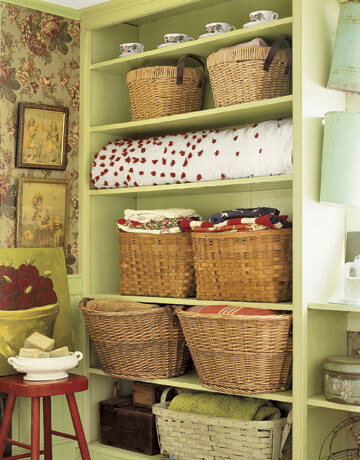 LOVE a nice organized laundry room! I bought an old beat up cabinet that Bill hung up in our laundry room. It's a nice vintage touch . . . now for that nice wall-mounted drying rack! Can't wait to see it all "unfold"! Can't wait to see it! great inspiration pics. Sorry fro deleting my post. Still trying to figure out how it all works! What I wanted to say is that I have a lot of fun reading your posts. They are not only informative but very entertaining!!! Keep them coming! 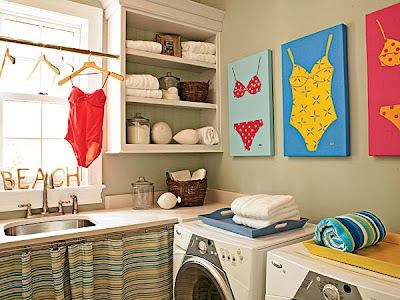 I love the retro laundry room! 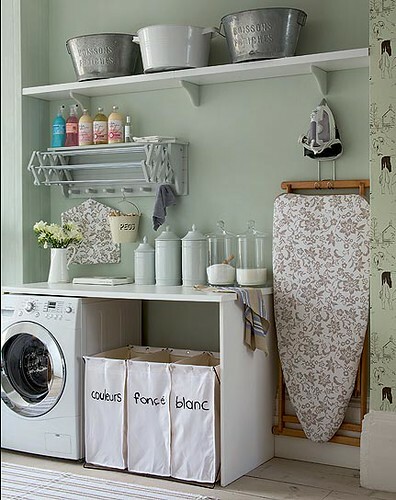 I would like a laundry room like that with a little bit of French flair of course. 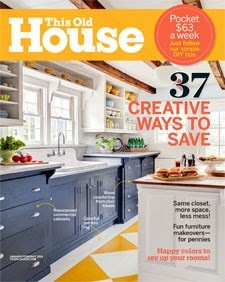 :) Can't wait to see how your laundry room comes out! Yum, a Manuel Canovas fabric would definitely add pretty to any sink skirt! Love these inspiration images! And, really loved the skirt that Amy made. You are not alone, my laundry room is in the dark, damp basement. Yuck! 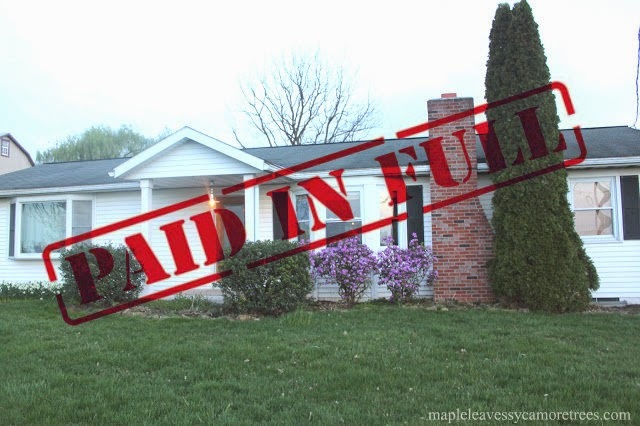 Wall insulation is a vital part of house energy cost savings. 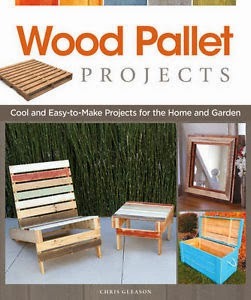 It helps to make your home cool down in the summer and also comfortable in the wintertime. It can do that by using a some limited level of energy resources in the house.